← How to print PDF to PCL via a command line? The software docPrint Pro is is a Windows printer driver that saves ink, paper and time by controlling printed output, it supports print 2, 4, 6, 8 or 16 pages on a single sheet of paper, it also supports scale A0, A1, A2, A3 papers to standard Letter or A4 paper sizes.docPrint Pro is also a Document Converter, it converts any printable document to 50+ graphics, it may be a Microsoft Word file, Adobe PDF file, HTML file, Excel file and others, Document Printer (docPrint) supports various image formats, resolutions and compressions.When you print a document of word to bmp with the virtual printer docPrint Pro,you will see a friendly and clear interface in which you can realize many kinds of functions only by some clicks.The whole process of conversion will also cost you no more than 2 minutes.So docprint is not only a powerful software,but an effective software. The download website of docPrint Pro is http://www.verypdf.com/artprint/docprint_pro_setup.exe. From the website we can find that the software is an executable setup file and you can install it in your computer by only double click the file and follow the prompt of each step.After installation,you can see docPrint appears in your computer by clicking “start”—“Printers and Faxes”,which can open a dialog named “Printers and Faxes”.In the dialog box you can see all the printers or faxed installed in your computer. 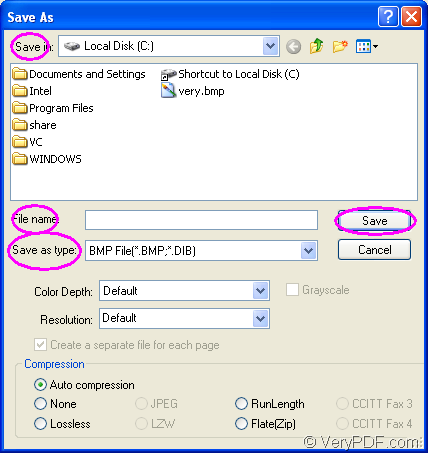 Here are three main steps to convert word to bmp with docPrint Pro for your reference. You can take the following three ways to realize the same function. 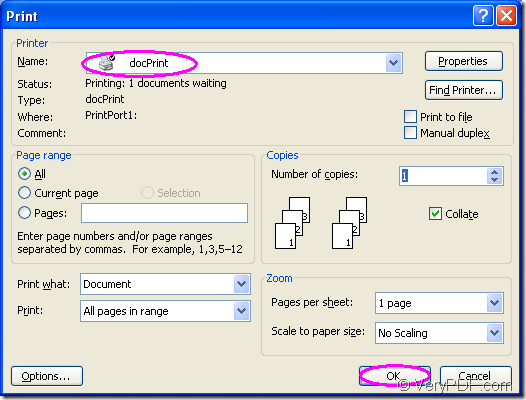 (1)After double clicking the word document to open it,you should click “File” and click “Print” in the dropdown list,then you will see “Print” dialog box pops up.Choose the current printer as “docPrint” in “Name” combo box and click “OK” button.Please see Figure1. (2)After opening word document,you can use the hot key “Ctrl”+ “P” to open the “Print” dialog box,then do the same next as method (1) shows. 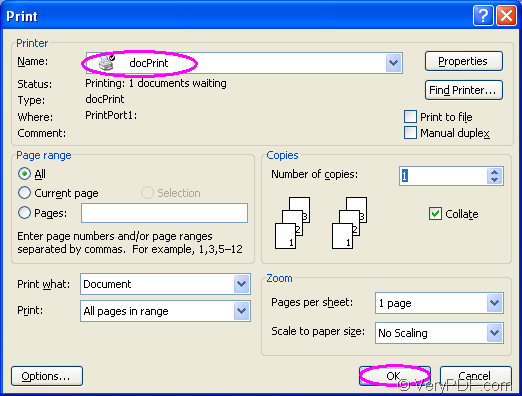 (3)If you have chosen docPrint Pro as the default printer when you install it,you can right click your mouse on the word document and click “Print” in the dropdown list instead of opening the file,which will save you a lot of time. In popup “docPrint”dialog box,you should follow three methods below to open “Save As” dialog box in which you can save your target file. (1) You can click “File” and click “Save As” in dropdown list.Please see Figure2. (2) You can also click the icon in toolbar to open “Save As” dialog box. (3) The hot key “Ctrl”+ “S” will also work. 3.Save and name the target file. 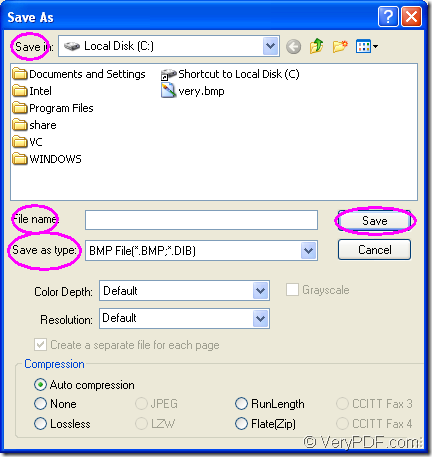 In save as dialog box showed in Figure3,you can specify the directory for the target file in “Save in” dialog box,edit the file name in “File name” edit box and choose the file type for the target file as BMP File in “Save as type” combo box.Then you should click “Save” button to save the file. What you should do next is to wait for several seconds,maybe no more than 10 seconds until the conversion of word to bmp is over.You can find the target file in specified location,which is the end of your conversion. How to convert Word to BMP via command line? This entry was posted in docPrint Pro and tagged Word to BMP. Bookmark the permalink.